An easy 2-0 day for 1 unit plays on Tuesday...Both in the NBA!!! An easy 2-0 day for 1 unit plays on Tuesday…Both in the NBA!!! Tuesday we had two 1 unit plays and went 2-0. Both were in the NBA with Orlando +12.5 winning the game outright 95-83 and Detroit +3.5 also winning outright 112-89. “Those are fine if you do not have your own. I used to use kenpom back when I was betting totals on pinnacle. But those lines were off by 20 pts on occasion so I didn’t need anything more accurate than kenpom. Football outsiders is also ok as long as you know the formula for converting to a spread and us the right home field adjustment. For baseball, any site like Fangraphs will do. The key is that models should be used only as an exclusionary filter. Not for predicting outcomes. Even then you can make an argument that models like this are useless. It’s a very complex topic. “If I were starting out and know what I know now I would not spend a lot of time and energy on models. Models are the most time consuming and have the least rewards. There was a time when I felt models were a complete waste of time and discarded them completely. But my results suffered so I went back to using them. They have models along with data going back 10 years or more. Put them in a database or spreadsheet. Then run an analysis on which are more predictive .Do not take the web sites numbers for how they did as a good result. The website does not differentiate between a prediction that is .5 pts different compared to 1 that is 10 pts different than the line. So you need to determine at what point each model becomes predictive over 52% winners. It might be a 5 pt difference or maybe a 10 pt difference from the spread or maybe not at all. But I am sure you will find one or two models that work out. If you want to get more accurate on this you need to break it down between home, away, neutral. And then again favorite or dog. Depending on the sport you will find that Home dogs in many instances are not as rewarding as road dogs. It’s rare to find it the other way around but again there are certain circumstances where an exception exists. Now if you do all of that and run the proper analysis you will be able to circumvent the very difficult task of starting a model from scratch. If your intent on modeling get back to me and I can give you a few more tips. But remember modeling while many think it’s the holy grail for handicapping its far from that. Only a filter if you know how to use them. 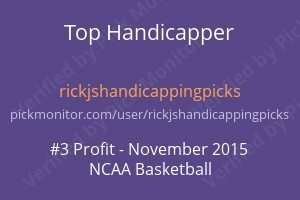 I have thought from time to time do that myself however I have my routine in place that I use and I spend my time on other areas of handicapping that tend to bring better results if understood and applied correctly. If anyone has any questions on this topic feel free to send me an email. 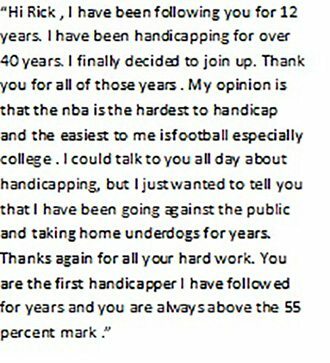 I enjoy discussing the various handicapping techniques that bettors use. And most discussions can be a great learning experience for all.